Despite the introduction of new material formats, physical books and other materials continue to be heavily circulated. According to the 2015 State of America’s Libraries report, circulation per capita has increased 16.7% over the last 10 years and libraries circulated more than 2.4 million items last year alone. This is encouraging news for libraries, but it makes it more important than ever to consider book care and ways to keep your collection in good order. Fortunately, there are some preventative measures that can help prolong the life of your materials and create efficiencies so that you still have time in your day for programming, outreach and community engagement. I’m a firm believer in working smarter, not harder. The right library supplies and equipment can help you do exactly that! Why Give Library Materials CPR? CPR for books and other materials is all about saving time and money. With the proper circulation, protection and repair products and tactics, you’ll extend the life of your collection. The formats and types of materials that are being circulated are evolving, with librarians building larger collections of high-circulating materials and seeing an increase in circulation of eBooks. Many libraries are also experimenting with alternative collection management techniques, including floating collections (books stay at the location where they are returned) and new ways of presenting collections to users, such as genre vs. Dewey organization and face-out merchandising. Regardless of what or how materials are being circulated, keeping materials in good shape is essential to keeping them moving. Equally important is managing the materials as they are returned to the library. Some libraries have told us they sometimes have to close their book returns over holiday weekends because they can’t handle demand based on the volume of materials being returned. One solution that has gained popularity is automated materials handling. Automated equipment helps even in smaller libraries to reduce handling and staff processing time and get items back in circulation sooner. Self checkouts are another great way for library patrons to efficiently serve themselves and free up staff for planning, programming and answering questions. I recommend that libraries protect new materials from the start, as I hear from librarians how well this strategy works. 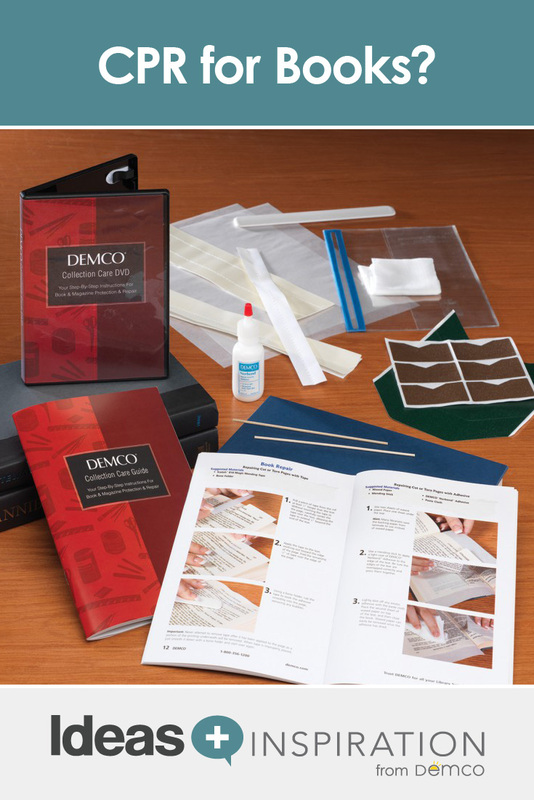 For example, I often receive customer feedback on how Demco’s laminates and book jacket covers extend the life of their materials by several years. There are several products that prevent book covers from tearing and keep bindings from falling apart, and CD cases help prevent scratches. Materials outfitted with the proper protective supplies save you time down the road, and your collection stays pristine longer, which compels more people to check out the materials. A logical strategy for any library when it comes to repairs is to attend to materials at the first signs of damage. Small, proactive repairs are better than time-consuming book rehab or expensive replacements later on. This also means you’ll want to have a comprehensive selection of repair supplies on hand for any situation you may encounter. 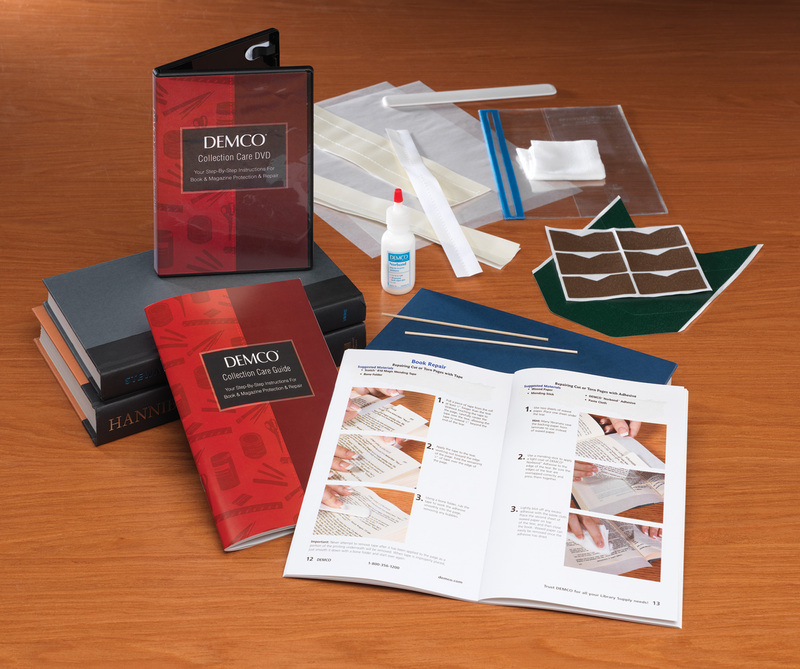 In our Book Doctor blog series, our book repair expert walks you through tried-and-true book repair supplies to have in your library’s toolkit and provides step-by-step instructions on how to deal with the toughest of repair jobs, such as how to get chewing gum off materials. We know that your time is limited, so this idea gallery makes it easy for you to quickly find the most effective solutions for your library. The featured book care essentials will help you protect your collection and circulate your materials longer — all while saving you time. Product Manager at Demco, Inc.
As a Product Manager at Demco, Chad specializes in library supplies. He works closely with Demco’s manufacturing managers to update products based on library trends and customer feedback. Chad values libraries and finds it exciting to do work he enjoys. He holds a Bachelor of Arts degree from the University of Wisconsin-La Crosse. In his free time, he plays tennis, swims and reads dystopia style books (but not all at the same time).